Rosy | ATAC Resources Ltd. 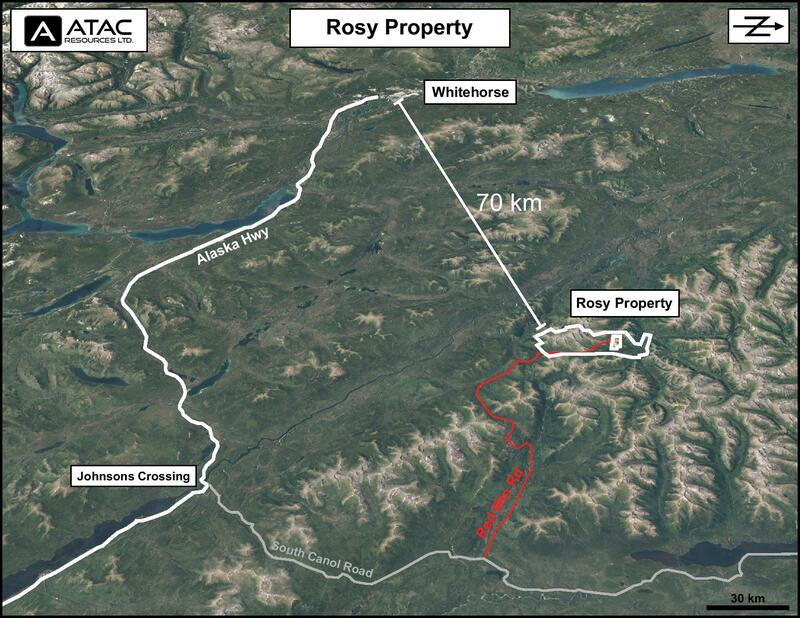 The Rosy property comprises 353 contiguous mineral claims located on the Red Mountain access road, 77 km east-northeast of Whitehorse. The property hosts widespread gold-and-silver bearing veins that appear to be associated with Late Cretaceous intrusive activity. Mineralization on the Rosy property is indicative of the distal part of a large hydrothermal system, likely in a low-sulphidation epithermal setting. The Rosy property hosts two main types of mineralization. The first occurs within quartz carbonate veins, while the second is found in altered intrusive rocks. Over 30 separate quartz-carbonate veins have been mapped on the property and occur with gouge zones, quartz-feldspar porphyry dykes and carbonate altered wall rocks. The property is predominantly underlain by Devonian to Mississippian aged metasedimentary and metavolcanic rock of the Yukon-Tanana Terrane. In the southern part of the property, these rocks are intruded by the Early Jurassic Sawtooth Pluton, which comprises weakly foliated hornblende-biotite granodiorite.In the northern part of the property, Yukon-Tanana rocks are cut by the Late Cretaceous Boswell Pluton, which hosts the Red Mountain Molybdenum Deposit.A contact aureole of rusty fractured hornfels surrounds the Boswell Pluton. R1 - a 15 m to 20 m wide area of rusty orange soil containing quartz-carbonate vein float and minor amounts of altered intrusive rock. 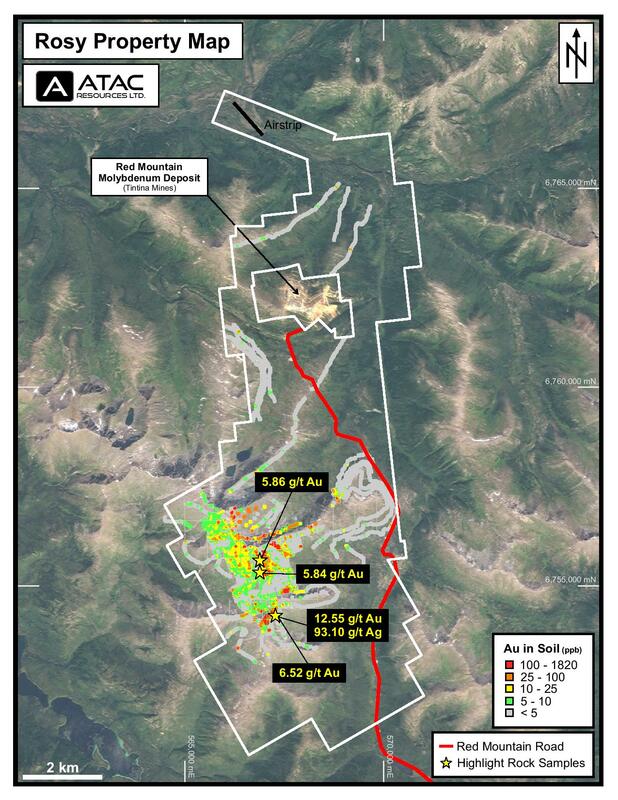 Samples of vein material returned values ranging from 2.14 to 4.42 g/t gold while samples of altered intrusive rock yielded 1.09 and 1.79 g/t gold. R2 - a 20 m wide area of orange-brown rusty soil containing scattered quartz-carbonate float, which has assayed up to 35.92 g/t gold. In 2008, five rock samples from R2 returned between 2.41 and 5.84 g/t gold. R3 - consisting of two samples taken approximately 200 m apart. The first sample was collected from a saddle on a ridge and yielded 1.45 g/t gold with 7.7 g/t silver. The other sample was found 200 m west of the ridge crest on a west facing talus slope and returned 0.536 g/t gold, 1.7 g/t silver. Three short diamond drill holes were completed on the property in 2010, with the best result being 2.29 g/t gold across an intersected vein width of 2.29 metres. Further prospecting and geophysical surveys were recommended in 2010 by the Company's consultant to develop bulk tonnage drill targets southeast of the drill holes, in a geochemically anomalous area of low topographic relief covered by glacial till and vegetation. This geochemical anomaly remains undrilled. In 2016, ATAC conducted a two day prospecting and soil sampling program, collecting 32 rock samples and 115 soil samples. Three of the vein samples collected 350 m north of the R3 vein zone returned 12.55, 6.52, and 5.20 g/t gold with 93.10, 13.85, and 11.05 g/t silver, respectively. Two rock samples collected 295 m north of the R2 vein returned 5.86 and 2.57 g/t gold with 3.76 and 73.1 g/t silver, respectively. In 2017, two rock samples of significance were collected from the property. The first sample was located northwest of R1 and returned 4.57 g/t gold and 83.9 g/t silver. The second rock sample was collected two kilometers northeast of the R1 vein and assayed 1.74 g/t gold and 30.0 g/t silver. All occurrences and soil anomalies have seen limited exploration and require systematic follow-up work. The property hosts an extensive system of precious metal enriched veins and is expected to yield additional discoveries with thorough exploration. The property is underlain by a foliated Jurassic granodiorite body that intrudes Paleozoic aged metamorphic rocks that are further intruded by Late Cretaceous quartz-feldspar porphyry dykes. At least 35 quartz-carbonate veins have been discovered on the property. They occur within fault zones, alongside young quartz-porphyry dykes and in adjacent altered granodiorite. They are recessive and rarely seen in outcrop. Mineralization consists of pyrite and lesser arsenopyrite that comprise up to 10% of the vein material. Finely disseminated sulphides also occur in quartz veinlets that occur peripheral to the main veins. Prospecting grab samples assayed up to 35.9 g/t gold.